← Fancy Coffee Friday: Lumbersexuals? Welcome, welcome! Let me get your coat. It’ll be in the guest room. Oh, don’t mind your shoes… the cats throw up on the carpet all the time and the sand gets into everything anyway. One of these years we’re going to have to get the carpets and upholstery cleaned… probably after the cats are dead. Help yourself to drinks and we’ll be frying the turkey pretty soon. How’s the wine? Good! We thought it turned out pretty well, too. Not too sweet, not too dry. Mr. Muse is really doing well at this homemade wine making. Baking bread? You betcha. I might be gluten-free, but that doesn’t mean I won’t have some tasty bread on the table for this day. I even found gluten free cream of mushroom soup so green bean casserole is back on the menu. Okay everyone, dinner is served! I believe that taking a moment every day to give thanks for all the things going right in our lives is important. At Thanksgiving, we have the opportunity to voice our thanks directly to those for whom we are thankful. So, this Thanksgiving I wanted to take a bit of your time to let you, my Dear Readers, know that I’m incredibly thankful that you not only subscribe to this blog, but you read it and some of you even leave comments. I don’t know where this blog is going, but thank you for coming along for the ride. I hope it’s as much fun for you as it is for me. Next, because I know everyone is hungry and I know that the smell of that stuffing is making my stomach growl, here’s a quick list of things that I’m thankful for that don’t normally make the more serious lists. 1. Gluten-free mascara and eyeliner. You may still make my eyes water, but it’s not as bad. 2. Music with dirty lyrics. If you see me driving and singing… now you know. 3. Black leather. It looks good. It smells good. It feels good. 5. Knowing how to use low gears on a vehicle, even if it’s automatic. 6. Power strips. So many things to plug in, so few outlets. Oh wait! 7. Mouse traps. Sure the mice dancing overhead are cute… but they ARE mice. 8. Toilet paper. If you’ve ever sat down and been without… you know. 9. Toothpaste. Morning-breath-of-death be banished! At least until I’ve had coffee. 10. Breathing. I couldn’t live without it. What are YOU thankful for in 2014? 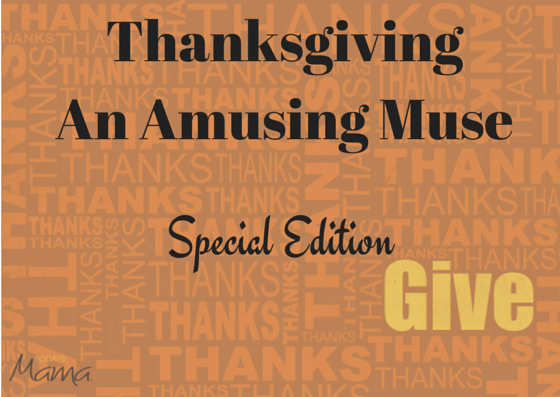 This entry was posted in Blogging, Humor, Musings, Personal and tagged being thankful, black leather, breathing, Chicken Poop Lip Junk, downshifting automatic transmission, gluten free mascara, In This Moment Whore, mouse traps, music with dirty lyrics, power strips, Thanksgiving 2014, the amusing muse, toilet paper, toothpaste. Bookmark the permalink. Thank you, William. I hope yours was wonderful as well. Two gatherings down for me and STILL no turkey, but that’s being solved today as Mr. Muse and I are having friends over and we’re deep-frying one. Plus, we’ve made the whole meal so I know I can eat everything! We’re thankful for a friend and an “amusing” blog! HA ! HA! I see what you did there. Thank you! Although we have already celebrated our Thanksgiving (the second weekend in October for us Canuckians), I am compelled to share that for which I am grateful, however, I do not wish to usurp this fine blog by making it about me. I am grateful I shoveled snow today. Because it reminds me I have a home with a driveway that holds a car and I still have relatively good bod that can do the work and I when I’m done shoveling, I have a warm place to shelter. Shoveling reminds me of just how good I got it. I have to say that you’re one of the few people I know who has admitted to being thankful for being capable. I do it as well – my first heart procedure made me realize that I could have it a whole lot worse than I do – so, I started to make a point of telling my body I was thankful for everything it could do. Though where Mr. Muse and I live hasn’t been hit with the deep snowfall yet – being able to get outside and shovel what we did get DOES feel good – especially when I look at a cleared sidewalk or path out to the barn. I’m thankful for family and friends,, for yesterday, today and tomorrow and for that sunshine filtering through the blinds across the new snow. Considering the alternative, ain’t life grand?! Life definitely IS grand. 🙂 Did you take a nap with Rosie in that sunbeam? I’m thankful for the common smiles, witticisms, & provocative thoughts provided here. Next year, I’m making my own wine. Your blog is such fun ! Happy Thanksgiving ! Thank you! I try 😀 I hope your Thanksgiving was great!